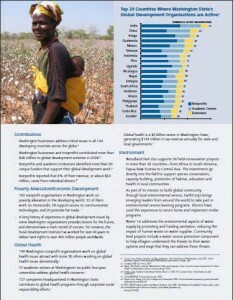 Welcome to the November 2009 issue of the Global Washington newsletter. If you would like to contact us directly, please email us. It’s been a busy time at Global Washington as we gear up for our annual conference in December. With all of the recent successes and achievements in Washington State’s development community, collaboration among organizations to create a unified voice is more important than ever. That’s why Global Washington is interested in hearing from you: What do you need to build your organization’s capacity in Washington State? We encourage you to contribute your innovative thoughts and ideas on how to move Washington State forward as a powerful collective of organizations working in the global development community. Please visit BlueprintForAction.Org to share your vision as part of our Blueprint for Action. Vote on those ideas and priorities you feel are most vital for building capacity among global development organizations in Washington State. Global Washington, in partnership with Berk & Associates (a public policy consulting firm),contacted 763 businesses, academic centers, nonprofits and foundations in March and April 2009, inviting them to complete a survey of their global development activities. 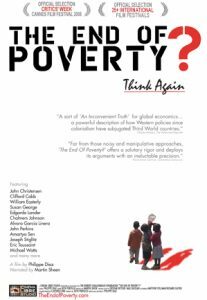 Of an estimated 763 organizations, a sampling of 122 met our definition of global development work based on their survey responses, including their reported activities in the developing world and the kind of issues they reported addressing. The results have been developed into a Global Development Sector Profile for the state of Washington to demonstrate just how vital global development is to Washington’s future. This profile describes the impact of Washington’s global development sector both at home in Washington and around the world, and highlights the unique strengths and accomplishments of our region. “Rooted in extraordinary vision and leadership. Washington’s global development sector is becoming an international force. Academic, business, philanthropic and nonprofit leaders from across the state are making crucial contributions to global health, poverty alleviation, the environment and education.” Click here to view the entire document as a PDF. 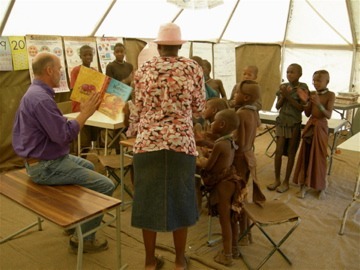 Featured Organization: The Wang Center for Global Education at Pacific Lutheran University. The Wang Center for Global Education at Pacific Lutheran University has achieved a record in international global education that no other institution shares. In 2006 it was the first university to have programs going simultaneously to all seven continents. According to Mary M. Dwyer, president of the Institute of the International Education of Students, simultaneous study on seven continents was “a first in the field of education abroad and puts PLU in the forefront of undergraduate education where education abroad is no longer a frill but rather central to a high quality college education.” PLU will again have students studying on all seven continents in 2010. PLU has placed among the top 10 master’s degree universities in the United States for percentage of students engaged in international study. 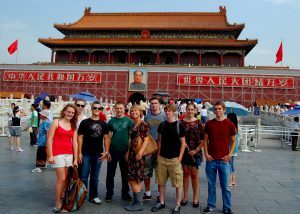 Over 40 percent of PLU students study abroad. The national study abroad average is 3 percent. These broad efforts are the result of three decades of faculty initiatives accepted by the University. The big push came in 2003 when PLU adopted its strategic plan for PLU 2010 and beyond. The plan adopted global education as an integral part of a university education. The two overarching goals of the program were to increase participation of the PLU community in global education and to enhance the quality of its global education programs. To achieve the latter, the University is implementing a model of education it calls PLU’s Global Education Continuum which contains four developmental phases intended to nurture the ability to participate actively in learning and working environments in global contexts. Ideally students are exposed to introductory information about global problems and issues, are given the chance to explore this information through an off-campus course summer or J-Term course, participate in another culture in a semester or year long course away, and then integrate their knowledge by bringing home what they have learned. PLU’s goal is to have fifty percent of the students study abroad. In a graduating class of 700, three or four hundred students will have spent at least four weeks away in intensive study. The effort to totally integrate the global program into the life of the university has been integral to making PLU a globally-focused university. PLU uses the term ‘study away’ as it does not just limit global education to studying abroad. PLU offers several domestic programs, in addition to those offered abroad, believing that students can gain valuable cultural and global perspectives within their own state, and even their own community. Why PLU? How does a small college in Tacoma, Washington, make global education central to its mission to educate its students? It starts with PLU’s background as a Lutheran college which inherited the international development approach of its Norwegian founders: Conflict Resolution and Democracy Building. But Neal Sobania, Director of the Wang Center, freely admits that “the best ideas are stolen.” That works both ways. While PLU has borrowed ideas from other schools in the past, other schools now also borrow from PLU’s proven excellence. PLU calls its travelers abroad “Sojourners,” and makes available to them a wide variety of programs. Gateway programs are semester-long study away programs that have been designed and developed by PLU and several key PLU faculty members. One example is the Norway-Namibia Project where students study in Norway alongside Namibian and Norwegian students and learn of Norway’s approach to democracy, development, and peace in the world today. Or students may spend a semester or year at Sichuan University (SU) in Chengdu, China, taking classes in Mandarin and Chinese culture, and other courses taught in English. In addition to the Gateway programs, PLU students may participate in programs developed in conjunction with other universities and institutions, such as a program in Windhoek-Namibia offered through the Consortium for Global Education (CGE) in spring and fall semesters. This program focuses on nation building, globalization and decolonizing the mind from Southern African perspectives. Finally there are J-Term programs led by PLU faculty that take place between the end of the fall semester and beginning of the spring semester. These courses go under such course titles as “Journey to the End of the Earth: Antarctica, Patagonia, Buenos Aires,” and environmental literature offering from the English Department, or “Telling Their Story: Arts and news Media in the United Arab Emirates” in the Communications Department. PLU received one million dollars from the Bill & Melinda Gates Foundation in a challenge grant which PLU met resulting in a two million dollar endowment to provide students on campus with funds to go abroad such as those who are on Pell grant support. 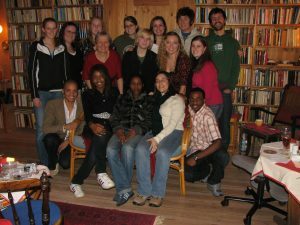 PLU also received the 2009 Senator Paul Simon Award for Campus Internationalization, a prestigious award honoring outstanding efforts on and off campus to engage the world and the international community. PLU is the first and only private college in the West to have received this honor. A chapel stands off to side of the Seattle University campus infused with light. Depending upon where the visitor is in the chapel and the time of day, the light reflects the different colors of the painted baffles that hang in front of windows cut high in the chapel’s walls at the ceiling. A more traditional source filters light directly into the chapel through rectangles of colored glass set back in the walls like shadow boxes. The design, by architect Stephen Holl, is inspired by the way St. Ignatius of Loyola, the founder of the Jesuits, learned how to discern interior lights and darkness. The light Joe Orlando shows the world has similar sources. One major inspiration in his life reflects the countries and cultures he has visited and learned to love since that first trip abroad. The more direct light is his own interpretation of the world through his education and work. We all grow by both absorption and effort. 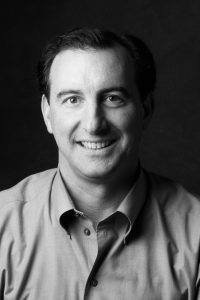 Joe Orlando is the Assistant Vice President of Mission and Ministry at Seattle University, and the Director of Jesuit Identity there. He has a B.A. from Harvard College, a Master of Divinity from Weston Jesuit School of Theology, a Master of Social Work from the University of Washington, and a Doctorate in Educational Leadership from Seattle University. In charge of SU’s efforts to involve its students and faculty in mission-inspired outreach to local and international communities, Joe’s hands are full. A junior year semester abroad in Florence to round out the Italian he was studying had a huge impact on his life. He became interested in Latin America and returned home to apply his Italian to quickly learning Spanish. 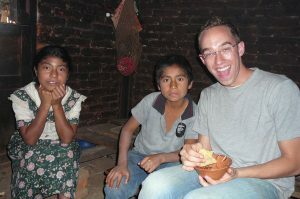 After graduation and a month of service work in Mexico, he had the opportunity to go to Colombia as a translator for a medical team and then to the Central Valley in California where he taught job skills to economically disadvantaged teens. 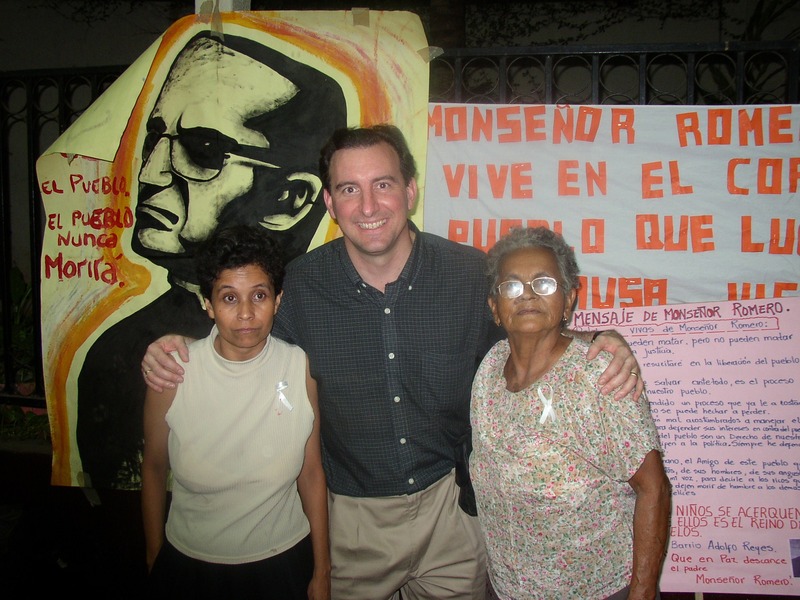 Then, working as the Assistant Director of the Jesuit International Volunteers, he traveled extensively around Central America, developing placements for volunteers. After completing graduate study in ministry at Weston School of Theology, now a part of Boston College, he came to Seattle University in 1990. As a Campus Minister, he helped students learn how to use their gifts in service to others, helping them reach out to those in prison or at soup kitchens. He put his knowledge of Central America to work, taking a dozen students to Belize over Spring Break to learn about other cultures and about being part of a global community. That program lasted for four years, before he transferred his attention to Nicaragua where the community was much poorer and demanded more from the students. There students spent Spring Break staying in homes of local families, working in community feeding programs and meeting at night after dinner to discuss what they learned during the day about the privileges they took for granted. Changing his focus from students to faculty and staff on becoming the Director of Jesuit Identity, Joe helps his colleagues understand how they can put the Jesuit mission into action in their roles on campus as teachers and leaders. To supplement programs such as retreats, speakers and discussion groups, Joe designed an annual nine day Nicaraguan immersion experience for 15 faculty and staff that emphasizes the Jesuit mission commitment to justice and global engagement. In 2001 he took a diverse group of faculty and staff to Nicaragua where they both learned about the development needs of the country, and learned from their Jesuit university counterparts in Managua about how the Jesuit mission can inspire action (the Universidad Centroamericana, or UCA) How, for example, does a law school do clinical work in Nicaragua? How does a university respond to the need for microfinance among the rural poor? This experience was so highly regarded by the faculty that in 2002, the President of Seattle University took his Executive Team along with some Deans and Trustees through a similar intensive nine day immersion program in Nicaragua, in close collaboration with peers at the UCA in Managua. Since 2001 the Nicaragua Immersion Experience has brought 85 faculty, 43 staff and 6 trustees/spouses to Nicaragua on 9 separate trips. 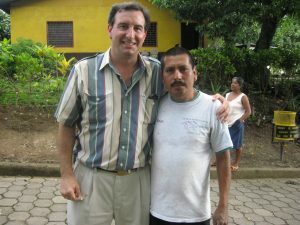 Joe’s formulation of the Nicaragua Immersion Experience in support of the Jesuit educational mission has born fruit. One SU biologist helped local farmers understand the genetic origins of freshwater shrimp through a Fulbright scholarship. An SU chemist developed a kit that farmers can use to tell them when the fermentation of coffee beans is done. SU’s chapter of Engineers without Borders redesigned an elementary school’s drainage system after the need was identified during a trip by the group’s faculty advisor to prevent flooding during the rainy season. Nursing students have participated in a five week community health practicum there. The Law School sends two students every summer to work on casework with their peers and to learn about legal issues around microfinance, such as land title problems. Following up on a marketing plan proposed by a visitor from the Business School, and in cooperation with the microfinance efforts of the UCA, the SU bookstore has sold more than $125,000 of crafts made by local artisans who are microloan recipients. But as is usually the case, these visits changed the visitors more than the visited. Teachers learned the difference that passion brings to their lives and teaching. Teaching about poverty means asking their students to actually speak to people who are poor. The skills local women showed in organizing themselves become text book examples in the classroom. 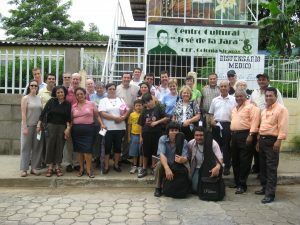 The experience of engagement in Nicaragua has encouraged the University to become more daring in its engagement at home. It is probably not a coincidence that the people who approved SU’s hosting of Tent City in 2005 had been on the Nicaragua trip in 2002. The visits also lead a trustee to propose, and Seattle University to endorse, the investment of University funds in microfinance efforts in developing countries in coordination with Global Partnerships. Joe’s goal, which he has presented to the Association of Jesuit Colleges and Universities (composed of 28 US universities, and linked with more than 200 Jesuit institutions worldwide), is that 1% of all Jesuit university investments be placed in microfinance endeavors. 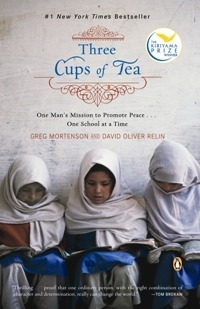 Three Cups of Tea tells the inspirational story of mountain climber Greg Mortenson, who lost his way while descending K2 and found himself on a new journey to build schools in one of the world’s most remote, destitute, and volatile regions. The story begins in 1993 when a lost and exhausted Mortenson stumbled into Korphe village, high up in the Karakoram mountains of Pakistan. While being nursed to health by the villagers, he was deeply touched by their kindness and generosity but disturbed to discover that the village children had no schoolhouse, pens, or paper with which to study. Mortenson swore he would return and build a school for Korphe. Not only did Mortenson fulfill this promise; he soon found himself building many more schools in the region. The book describes Mortenson’s tremendous dedication, self-sacrifice, and bravery. In the early days, he sold everything he owned to build the first school, wrote hundreds of fundraising letters on a typewriter (only to receive one small donation), worked long hours and slept in hallways to save money for the school. Even after he found a devoted sponsor and founded the Central Asia Institute, Mortenson allowed himself very little pay, and instead channeled every penny into building the schools. Over the years, Mortenson made dozens of trips into the remote regions of Pakistan and Afghanistan to scout and build these schools, refusing to be deterred by harsh and desolate geography, fatwas, kidnapping, death threats by fellow Americans, and war. Besides being an inspirational read, Three Cups of Tea provides a much-needed window into the lives and circumstances of Pakistanis and Afghans in the years before and after September 11th. The book depicts most of the people he encountered as moderate Muslims, extremely poor but full of hope and optimism for the future of their children, fans of the United States, and extremely grateful to Mortenson for building the schools. Reading the book gives one a sense of an alternative future for US-Muslim relations if not for Al Qaeda and September 11th. As luck would have it, though, September 11th did happen, and Mortenson found himself and his work at the center of international conflict. The book provides an amazing account of Mortenson watching as Al Quaeda troops rolled through Pakistan and into Afghanistan by the truckful just prior to the attack on America, setting up tens of thousands of Wahhabi madrassa (fundamentalist schools that often serve as terrorist training camps). Equally as interesting is Mortenson’s account of watching from the mountains of Pakistan as the September 11th attack and the war in Afghanistan unfolded. He tells us that the villagers were angry and outraged by the attack on “the village of New York”, but they were also not at all surprised that the attack was waged by Osama Bin Laden, a bad egg they had been observing from their side of the Afghan border. Refusing to leave even when foreigners were evacuated, Mortenson remained, vowing to continue building schools in Pakistan, and also to build them in Afghanistan. During this time, the schools took on a new relevance for Mortenson and for the many Americans who now took up his cause. Whereas the project began as a simple effort to bring education to remote villages that otherwise lacked schools and educational resources for their children, the schools now became a bastion against rise of Islamic fundamentalism in the region. They provide education to girls where Pakistani and Afghan schools would not; they offer a balanced and yet Islam-friendly alternative to the fundamentalist education taught in rapidly proliferating madrassas; they give impoverished villagers options for a brighter future; and they serve to root out ignorance that feeds the fires of terrorism in the region. One major lesson of the book that I take away is this: creating a successful international development program is about 60 percent hard work and determination, and 40 percent luck. By virtue of his tremendous will, self sacrifice, and relentless outreach, networking, and fundraising drive, Mortenson has been able to build the Central Asian Institute and some 130 schools since 1993. But much of this might never have happened if not for Mortenson’s chance introduction to the philanthropist Dr. Hoerni (indeed, even with his generous support, the Central Asian Institute struggled to keep financially afloat for several years). Nor would the Central Asia Institute have found such success if not for a turn of fate one sunny September morning in 2001, when US public attention shifted to this otherwise obscure region. With this crisis, Mortenson’s work became much more relevant to the American public and donations began pouring in, enabling him to expand operations both within Pakistan and into Afghanistan. PATH and Partners Awarded 5-year Contract and Funding for Congo HIV/AIDS Project: PATH and its project partners have been awarded a five-year contract to improve HIV/AIDS services in the Democratic Republic of Congo. The PATH-led consortium will receive up to $45 million in project funding from the US Agency for International Development (USAID). “This new project is a comprehensive and integrated response to the devastation caused by HIV/AIDS in the Democratic Republic of Congo,” said Julie Pulerwitz, ScD, director of the HIV/AIDS and Tuberculosis Program at PATH. “It will not only improve prevention, care, and treatment services in the short term but also strengthen the long-term capacity of local communities and health systems to meet the nation’s overwhelming needs.” To read more about this project, click here. Rural Development Institute Receives $9 million from Omidyar: Member organization R.D.I. has been awarded the largest grant in its history — $9 million over three years — from the Omidyar Network. According to Tim Hanstad, RDI’s president and CEO, “With this grant, RDI will begin implementing an ambitious three-year plan to bring secure land rights to 9 million families living in poverty. These rights can bring about transformative economic and social benefits that improve well-being and restore dignity.” In addition to receiving the grant, RDI launched its Global Center for Women’s Land Rights, an initiative dedicated to procuring land ownership for women. Click here to learn more about Rural Development Institute. Ashesi University and Patrick Awuah Win the 2009 John P. McNulty Prize: The jury, including Madeleine Albright and Bill Gates, Sr., awarded the prize for extraordinary leaders making creative, effective, and lasting contributions to their community earlier this month. It acknowledges the visionary leadership of Patrick Awuah in creating Ashesi University and its commitment to ethics and civics, which is guaranteeing future generations of leaders for Ghana, Africa and the world. Click here to read the Aspen Institute’s press release and to watch the new McNulty Prize video about Ashesi. December 4: Targeted Killings – The Decline of the Norm Against Assassination? December 8: Iraqi Priorities: A Conversation and Luncheon with Samir Sumaida’ie, Iraqi Ambassador to the U.S.
kind of issues they reported addressing.